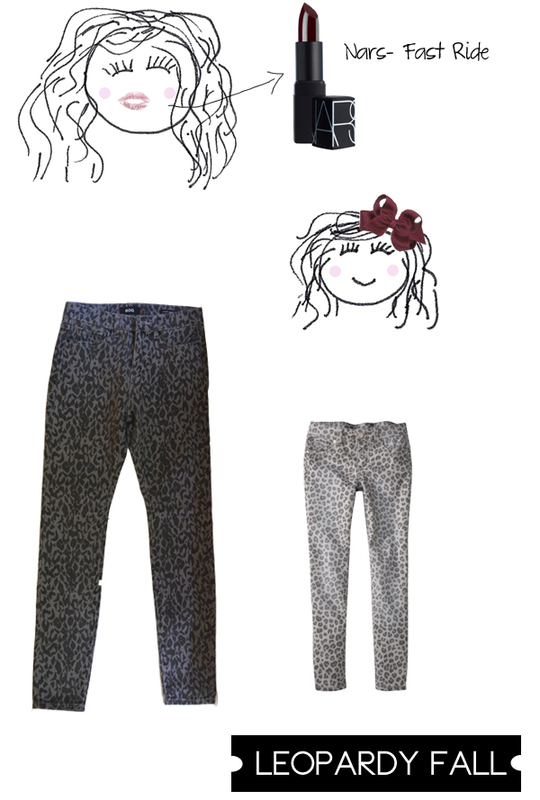 I spied some cute leopard jeans at Target that I needed to get for Little Miss A. My sweet aunt got them for her as a birthday present. What a cool aunt right? A few days after, I spotted some similar ones at Urban Outfitters for myself. All of a sudden I was curious to try them on. I did and the fit was actually kind of perfect. It had been a long time since I had bought clothing at Urban Outfitters (I mean really- since my teens!) so this was a welcome and unexpected surprise. I love wearing similar versions of the same thing with my little one. We don't do it often but it makes for a fun day. I will be adding the Nars- Fast Ride lip color to my outfit and little Ms. A can sport a burgundy hair on her golden curls. We are ready for fall! Do you like to dress up with your little one? That's so sweet!!! I think that will be a very fun thing to do when I have babies. I like that they aren't matchy, but go...ya know?! Happy Friday! So cute! I know when I have a little girl dressing up will be the best part! For now I just style my little dog. lol. Wow! I was at Target yesterday picking up house essentials and school basics, and these same little girl leopard jeans caught my eye. I managed to resist because we're all uniformed (including altered jumpers) up this year :). Great minds, A!! Love that you love them, too. LOVE!! You are both going to look super cute!